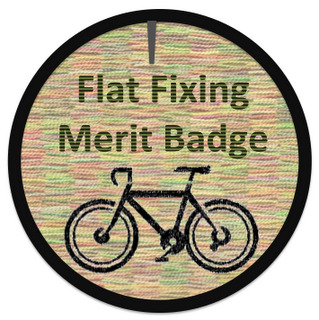 Cort the Sport: Flat Fixing Merit Badge - Earned! Today I fixed my first flat. Luckily it happened right at the end of my ride. I've had this fear that if I fix/touch/tweak anything on my bike, the bike will no longer be "as good" (fast, smooth) as it was before I fixed/touched/tweaked it. I've watched the bike shop change my flats before but then as I tried to do it, I didn't remember which way the tire levers went in, if I was supposed to pull the bead out of the rim (yes, but just on one side), etc. Duhhh. It seems to be fixed. I decided I needed to give myself a little "award" for finally fixing a flat, and none seemed to exist, so I made one. Feel free to award yourself the merit badge, or distribute to others who may need the motivation!